Earlier, when asked if he considered the violence an act of terrorism, Rauner said "you define terrorism"
Gov. Bruce Rauner on Monday condemned the deadly, race-fueled violence that took place in Virginia over the weekend as an "act of terrorism," a comment that follows backlash for his initial statements on the violent clashes. "It is outrageous, the behavior appalling, completely beyond anything America should be about," Rauner said. Earlier, when asked if he considered the violence an act of terrorism, Rauner said "you define terrorism." "What I'll say is that it's horrible, horrible behavior completely beyond the pale," he said. "We in America have to fight against it in every regard." J.B. Pritzker and Chris Kennedy, both candidates running against Rauner in the 2018 race for governor, decried Rauner's remarks. Two hours later, Rauner clarified his remarks in a statement, saying "the deadly violence in Charlottesville this weekend is abhorrent and absolutely an act of domestic terrorism." "Racism, hatred and violence have no place in our society," he said. "The individuals responsible should be prosecuted to the fullest extent of the law." President Donald Trump also spoke out about the violence once again Monday in an unscheduled address from the White House. 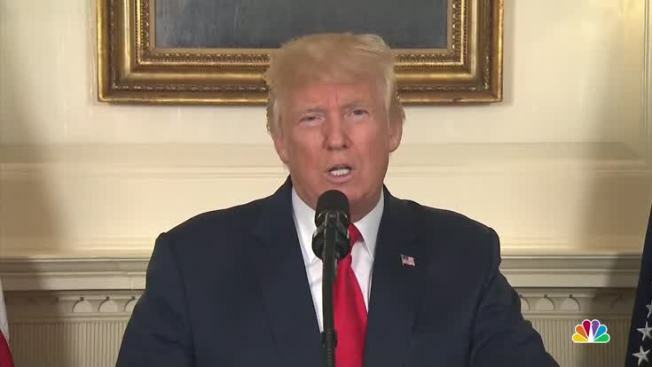 In his statement, Trump declared "racism is evil" after two days of bipartisan criticism for not explicitly condemning white supremacists and hate groups involved. "Racism is evil and those who cause violence in its name are criminals and thugs, including the KKK, neo-Nazis, white supremacists and other hate groups that are repugnant to everything we hold dear as Americans," Trump said. The specific condemnation of white supremacists and hate groups was something that members of both parties had called for from Trump in the wake of the violent clashes. On Saturday, he blamed bigotry "on many sides."